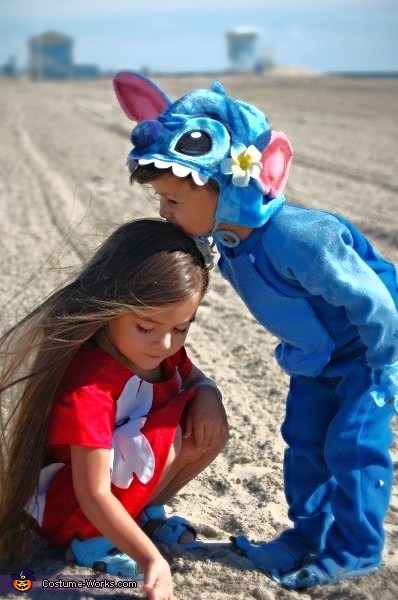 Lilo and Stitch. The dress was hand made with felt leaves and stitch a blanket sleeper with felt patches. I bought the stitch hat on line and painted to give further details. Thank you to the one who commented Beautiful! Love this! Where did you buy the Stitch hat? Thanks so much! Lee Ann...I bought hat from Ebay Thank you! So cute! Where did you get the Stitch sleeper? Thanks! Could you please give me more details on copying these amazing costumes? Were did you find the stuffed animal for Lilo? What pattern was used for the dress, etc.? This movie is really special to my family and I would love to be able to make these costumes for my little brother and sister. I bought the stitch hat also on ebay for 11.00 and painted to give a little more life to it. 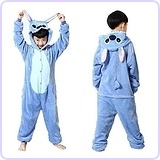 The stitch costume also an ebay find just search blue blanket sleeper and add felt to create his body and a pom pom for the tail. The flowers for hair 99 cent store or ebay sells them as well for the same price. I hope that helps. Thank you viewing. Scrump was a garage sale find. My luck only 50 cents. Do you by chance remember who the seller was on Ebsy that you got the Stitch hat from? 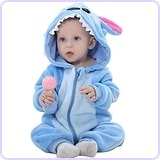 And do you think it will fit my 9 month olds head? He is a big boy and does have a big head for his age if that helps! I would hate to order and it doesn't fit. Thanks! Hi I don't have the buyer I did check eBay and the hat is still available of course at different prices and locations I would go for the lowest and the one that will deliver adapt since Halloween is around the corner and some sellers are international I have to say it may fit my granddaughter fit the hat find. Hi, would you be interested in making one to sell? I would be interested in buying it. Can I please please buy one like this !! !